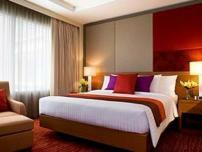 Looking for Bangkok travel ideas, where to stay in Bangkok or the best Bangkok beaches? 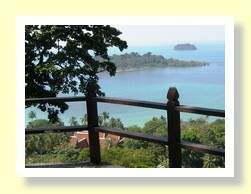 Maybe you are planning on going to Thailand in the future, or thinking about visiting the islands near Bangkok? If so, then you have come to the right place, because more people visit Bangkok, Thailand than any other destination in the world. Indeed Bangkok was the most visited city in the world, with over 20.05 million international visitors per year passing through Suvarnabhumi Airport in the year upto September 2018. 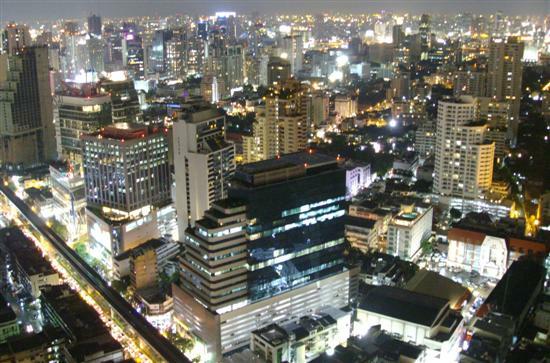 Bangkok is an exciting, vibrant, modern city with a wealth of tourist attractions and it is known as the gateway to the Orient for good reason. 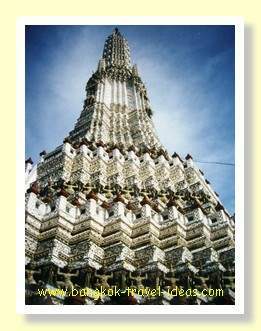 If you have never been to Bangkok before, then you must come and visit because there is so much to see and do and it is all explained here, in Bangkok Travel Ideas. Why Should I go to Bangkok? People come to Bangkok for all sorts of reasons. Some come to escape the Northern winter, some come for a Thailand vacation, some plan a short Bangkok layover on the long journey to Australia or New Zealand, to break up the trip. Then there are those that are heading for the beaches close to Bangkok, like those at Hua Hin, or to experience the crystal clear water of Koh Samet. Some even come to explore the exciting inland regions of Thailand. A few days at a one of the many Bangkok beaches or some retail therapy at a Bangkok shopping mall will do wonders for the soul. 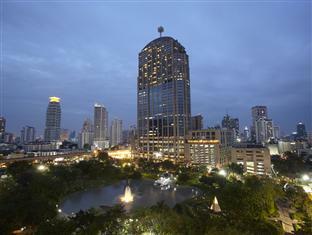 Sure, there is plenty to do here and whether you intend to visit Bangkok for a few days or a few weeks some early planning will let you make the most of your trip. 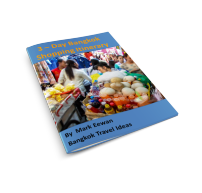 Explore this site for some great Bangkok travel ideas and travel tips that will save you time and money. The sights that you can see are just amazing. 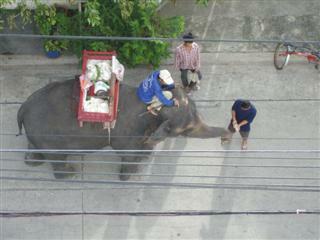 Look at this picture of a Thai elephant just wandering the local streets. Of course taking elephants into the city is discouraged by the local authorities, but you can still see small elephants being taken around the streets and being given food by tourists. 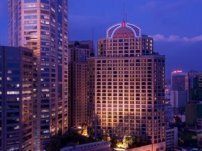 I travel to Bangkok frequently and using the power of the internet I have literally saved thousands of dollars over the years to research the very best Bangkok hotel deals and cheap flights to Bangkok. You can do the same by just following my simple guide. Of course, when I came to Bangkok it wasn't all work, sometimes I would have a weekend spare between flights where I would get a chance to see the sights, investigate the very best in Bangkok shopping, or visit one of the best Bangkok beaches before I had to fly off again. 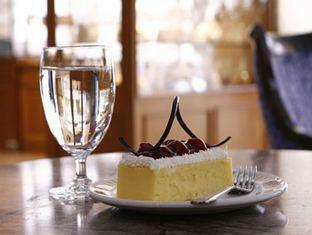 As a frequent business traveller I look for good value in nice hotels, not just the cheapest. I also value my health and personal safety so you are not going to find reviews of backpacker hostels or camping sites here. Not that they are not safe, just I never used this type of budget travel. This site is going to share many years experiences with you, where I went to, the things I did, both the good and the bad and reveal all the secrets that I learned during those years arranging my own Bangkok travel. Booking on the internet is really convenient, but did you know that you can't always trust the hotel descriptions given on websites? 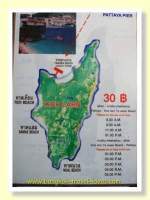 In fact a lot of the information is just cut and pasted and the same description is used for multiple hotels. You won't find that on Bangkok Travel Ideas. I wrote and typed all this information myself, based upon my travel experiences and I'm adding details to my Bangkok Travel Diary as I go. It is as real as it can be and I try and keep it as up to date as possible. What if I was to tell you that one major Asian travel website advertises a particular Bangkok hotel as being 5 minutes from Suvarnabhumi Airport when in fact it is two hours away by car. Booking something like this would cause serious disruption to your Bangkok holiday or your stopover and if you have never been to Bangkok before, you just wouldn't know... until you arrived. I am going to tell you how to avoid the scams, how to get cheap local travel, how to fly comfortably in economy class, and lots more. It doesn't matter if you are a tourist or a businessman like I was. If you are planning any Bangkok travel and you need to book some Bangkok accommodation for your stay here, then you are sure to find some of my Bangkok travel ideas useful. There are lots of photographs and write-ups of various places around the city as well as pictures of beaches near Bangkok. You can see and feel what each place is like, before you book. Looking for Beaches Near Bangkok? For example the photograph below, I took on Koh Samet, I call this photo my Bangkok Beach umbrella and it is one of my favourites. 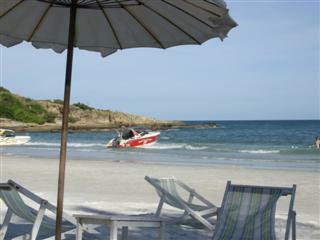 This is one of many beaches near Bangkok and you can easily get there by coach in under three hours. You can swim, eat seafood under the stars, listen to the waves lapping on the sand... and still be back to work for Monday. There are constant updates to this site with new Bangkok travel ideas and reviews of Bangkok hotels and shopping malls, all building upon the Asian travel theme, so visit regularly and start to plan your Bangkok travel now. 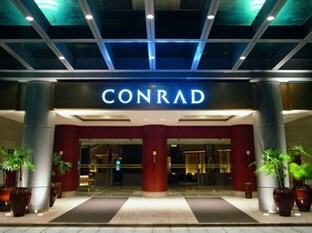 Can't decide where to stay? 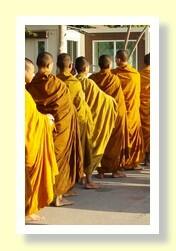 Need a guide to the main Bangkok districts or the beaches and islands near Bangkok? Well it is all here. Check out the Bangkok map below, showing key features of the city or jump straight to an overview of the main areas to stay in Bangkok. If you like what you read, then please link back to my site or give me a Facebook Like as you pass through. If you have any Bangkok Travel Ideas of your own, please let me know.